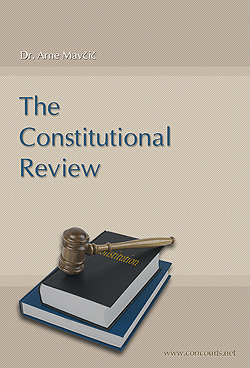 Book - "The Constitutional Review"
Quite a few of you were asking me for my book "The Constitutional Review" so we decided to reprint it and also provide it in electronic E-book format. This book presents a comparative constitutional analysis of the system of constitutional review in more than 150 countries. It describes different models of constitutional review and the bodies that hold this special and exclusive decision-making power on constitutional matters. It classifies the constitutional review bodies as special bodies responsible for protecting the constitutionality for which they hold a certain legal superiority in relation to other branches of power. Their review quite often covers legislative acts that are the highest legal instruments of a specific legal and political system. This gives the constitutional review body a special status with power to provide constitutional review under the system of the separation of powers, especially in relation to the legislative power that it may even annul statutes adopted by the legislative body. The book is from 2001 but since constitutions don't change that often the text is still mostly accurate. You can get updated versions of tables on this site. We are also preparing the revised 2009 version of the book (planned for the end of 2009). The eBook is in a protected Acrobat format which needs to be activated with a key online. - Single activation Key - can activate an eBook on a single computer at one time. Any activation can be deactivated on one computer and reactivated on another.